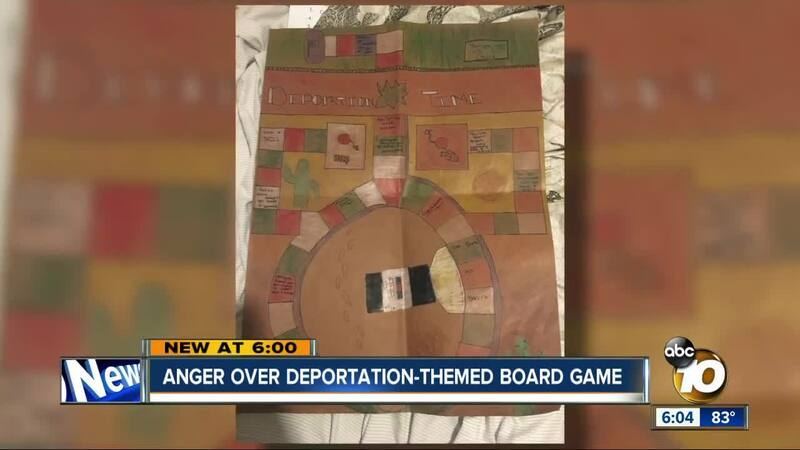 OCEANSIDE, Calif. (KGTV) - A board game created by a group of Oceanside middle school students for a class assignment is raising eyebrows for its subject matter. A mother at the school, who asked only to be identified as Danielle, says it happened in her son's career class at Cesar Chavez Middle School. They were tasked with creating a board game, and her son's group designed a "border crossing"-themed game. Danielle's son, Jake, says the theme was approved ahead of time by the teacher. He ultimately confided in his mom that the theme made him uncomfortable. “He wanted to make it known he was very, very uncomfortable with this assignment to be done this way," said Danielle. "I basically felt like I wanted to throw up because it was so disheartening to see somebody thought this was a good idea, especially given the climate of our political system today." Part of the game includes a penalty for players who land on the “Lamigra caught you go back to checkpoint” square, and players can deport a competitor to the start of the board if he or she rolls a 2. Another aspect of the game is players are required to go to a “Bomb Shop” to blow up a wall in order to cross the border. Danielle says she's frustrated the teacher pre-approved this idea and that she graded the assignment without providing any comments or discussing the sensitivity of the subject matter with students. "I have complete faith in Cesar Chavez to make things right, but they do need to begin with the instructor, I believe, students did something and she missed a good teaching opportunity," said Danielle. Multiple calls and emails to Oceanside Unified School District were not returned to 10News. The Union-Tribune, citing the state’s Department of Education, reported about 75 percent of Cesar Chavez Middle School students are Hispanic or Latino. The district did not disclose whether they have spoken to the teacher regarding the group’s board game.